If you haven’t had a chance to taste wines of Chateau Montelena of Napa, California, you might still have heard about it. Montelena was featured in the movie called “Bottle shock”, where it was THE new world producer to beat French wines in a blind tasting referred to as “The judgement of Paris” in 1976, held by the British wine expert Steven Spurrier. The movie is based on real events although there has been some criticism in regards to the accuracy of the script. This film is certainly not a masterpiece but still quite entertaining and a must-see for all wine lovers. But back to the wine! 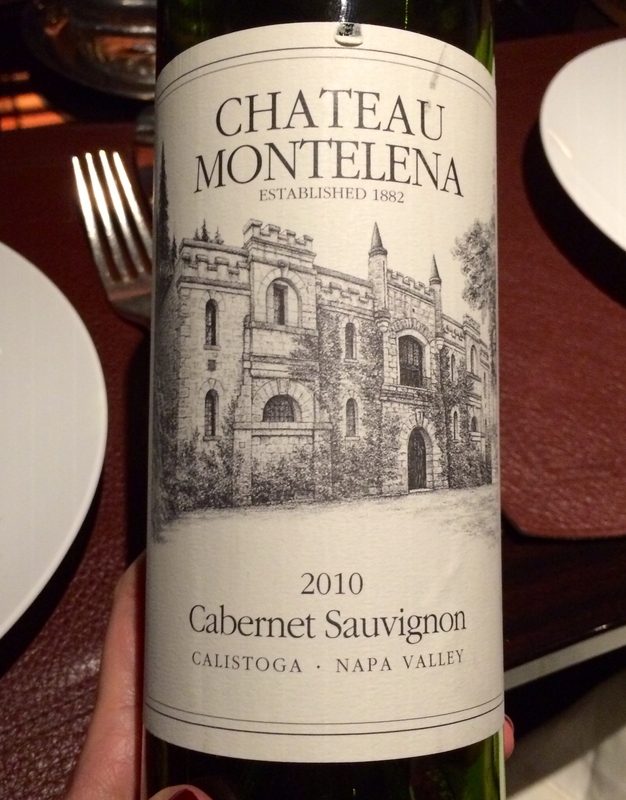 I discovered the 2010 Montelena Cabernet on the wine list at the CUT – a fantastic steak restaurant on London’s Park Lane – and looked no longer, I knew I had to try it! I apologize for the very brief wine description as it was rather difficult to focus on producing a full tasting note being in a big group of friends in a very lively environment. TASTING NOTE: smooth tannins, pronounced cassis notes; smoke/tar and floral aromas somewhat reminded me a bit of Barolo, although it was more violets rather that roses. Very good quality easy drinking wine that will develop further. Decanting recommended. The wine is a blend is 91% Cabernet Sauvignon, 7% Merlot and 2% Cabernet Franc and retails for an average of £30 per bottle; considering its quality, fame and ageing potential I find this a good value. It matched perfectly with a medium cooked USDA beef fillet mignon and was an excellent and more elegant alternative to my usual choice of Malbec to go with steaks. If you are interested in purchasing the wine drop me a line and I will be happy to help you source it.